When brothers Navid Karimi ’18 and Nader Karimi ’19 were in high school, Navid had a desire to pursue nursing while Nader planned to study engineering. 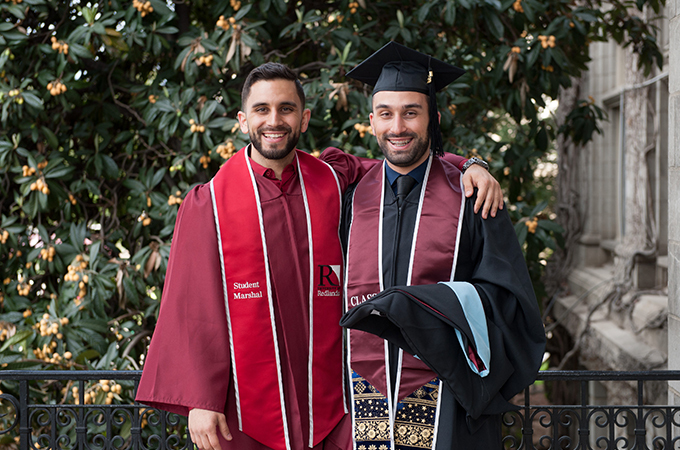 Nearly five years later, to their own surprise, the two brothers both have bachelor’s degrees in psychology and will both have earned their school counselor certification at the University of Redlands School of Education. After growing up in Rancho Cucamonga, California, Navid and Nader—born a year apart—attended different universities but wound up in the same field of study when Navid realized his aversion to blood would get in the way of nursing and Nader found that he wasn't passionate about engineering. Upon completing college, graduate school seemed like the next logical step and they both ended up choosing the University of Redlands because of its welcoming environment. Even though they never had a class together, the brothers say that their group counseling course, taught by Professor Jeanie Lohr, stands out as a favorite. The class incorporates group exercises in which students, acting as counselors, conduct group counseling sessions. Navid and Nader say they learned new techniques and skills that will help them in real client settings. Navid and Nader have their sights set on becoming middle school and college counselors, respectively.